Sigh of Ages taps into a lineage of signpost releases starting with the ’80s melodic era of Structures from Silence and Quiet Music up through the textural tour de force of 2003’s Mystic Chords & Sacred Spaces and 2009’s Dynamic Stillness. For this journey, Roach drew on his essential collection of beloved analog synthesizers including a classic 40-year-old Arp String Ensemble, a historic polyphonic synthesizer that breathes life into the track “Morning of Ages,” swirling and rolling upon itself like the strong currents of a rushing mountain river. “The View from Here” unfolds in a stately motion on a majestic sequenced pulse with voluminous melodic synthesizer clouds unfolding along the horizon. This alchemy of sounds creates a deeply nuanced album filled with shadow and light, unique within the language of Roach’s soundworlds. All art stems from a deeply personal space, and the output takes its form based largely on where we are emotionally as well as artistically at the time we create. When we’re happy we write love songs or paint in bright colors; when we’re sad, the songs get morose and packed with minor chords and the paintings get darker and more brooding. So when a work originates from a point of taking a long, introspective look at who the artist is, where he’s come from and how he views life in general, the result is going to be loaded with varied emotions and shifting forms of expression. 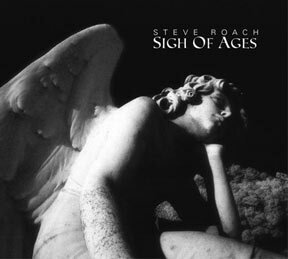 This is the nexus point of of Steve Roach’s newest offering, Sigh of Ages. There are also passages here that are as outrightly melodic as Roach has allowed himself to be in quite a while. “Morning of Ages” is an outpouring of emotion that borders on a wordless confessional. It packs feelings of remorse, longing and possibility–or perhaps what you hear in it is what you bring to it. But you will hear it. While it may sound entirely too posturingly metaphysical to say so, Sigh of Ages imparts a feeling of bare-souled honesty in every track, and this is what, in part, makes it such a stunningly gorgeous CD. It is Roach telling you that this is who he was, and is, and wanted to be, and hopes still to be, all in one go. From a listening standpoint it’s deep and surrounding, warm and, in spots, pleasantly energetic. This is a disc you will be listening to over and over, just to feel it again.